VALLEY CITY, N.D. (NewsDakota.com) – The Valley City School District held two public input meetings to give a presentation on the design proposal to build a new Track & Field facility at Hanna Field. Superintendent Josh Johnson said additional input about this project will be accepted, he’ll have more details about how people can submit their ideas later. He asked the public what they thought the facility should look like five years from now. Johnson gave a presentation about the design and other proposals during a meeting and it’s available at the bottom of this story. Johnson said under the timeline, the school board will make a decision on the first phase in mid-February and seek bids from construction companies in mid-March of 2018. A total of 100 people attended the January 15th meeting in Valley City. One of those was Laurel Neurauter. She’s the great-grand-daughter of G.W. Hanna. She supports the project. 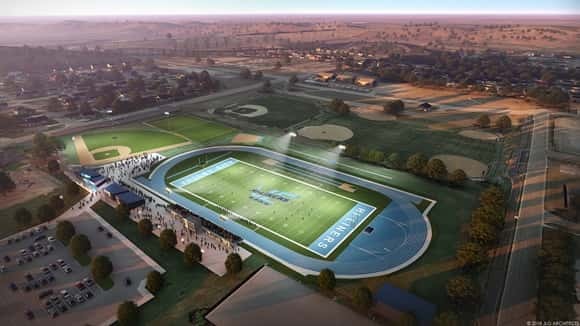 The Valley City School board hired two firms to help with the design concept of the proposed multi-phase Athletic Complex at Hanna Field. Details about the plan are available by viewing or listening to our video streamed posted below. The January 15th evening meeting was video streamed live inside the Hi Liner Activity Center lobby and is available below, just click on the white colored arrow.